In its April 2018 Monthly Treasury Statement, the federal government reported that it ran an all-time single-month record $214 billion surplus, primarily because it took in a record $510 billion in receipts. The Associated Press's Josh Boak ignored the collections record, even though the AP noted the previous record when it occurred in 2015. Instead, Boak presented a different and far smaller out-of-context collections figure, and falsely claimed that the Republican Congress's tax cuts are responsible for the increase in fiscal 2018's seven-month budget deficit compared to last year. This negligence irresponsibly enables leftist pundits to continue to scream that the tax cuts aren't working, despite growing evidence that they really are. Federal tax collections are highest every April because final payments of prior-year income taxes and current-year first-quarter estimated payments are due from entrepreneurs, business owners, and investors who otherwise don't have taxes withheld. The previous single-month collections record was $471.8 billion in April 2015. The $510.4 billion collected last month smashes that previous high by over 8 percent, and is 12 percent greater than the $455.6 billion collected in April 2017. Receipts collected in April were $30 billion to $40 billion larger than CBO expected when it prepared the estimates reported in The Budget and Economic Outlook: 2018 to 2028, which it issued on April 9. 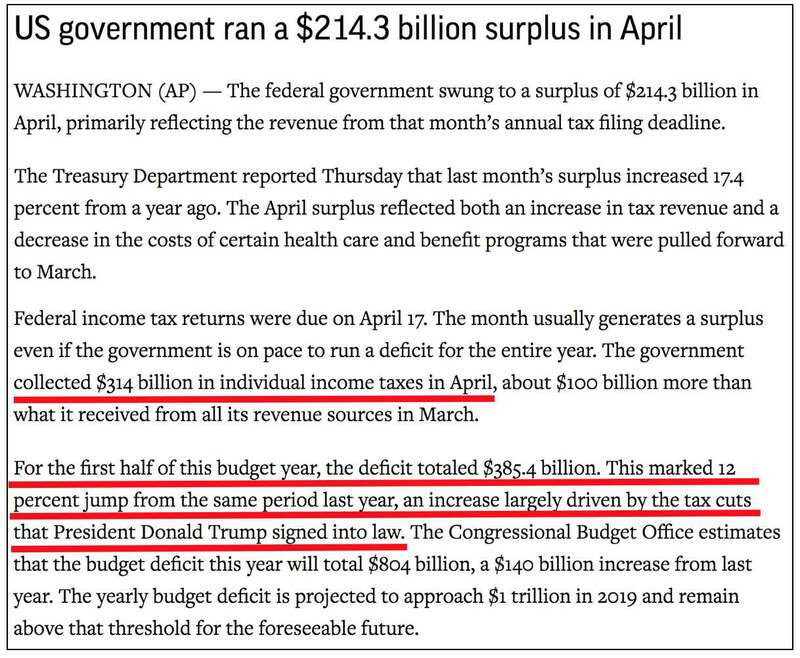 Boak also failed to note that April's $314 billion in income-tax collections was a stunning 26 percent higher than the $249 billion collected in April 2017. The government's fiscal year runs from October to September. Tax cuts which became law in late December obviously had little impact on fiscal 2018's first quarter. Total collections through this year's first seven months are $79 billion (4.1 percent) higher than last year's comparable figure. The problem is spending, which through seven months is up by $120 billion (5.2 percent) over last year. In a May 10 editorial, Investor's Business Daily cited April's collections as evidence that "those of us who predicted the pro-growth tax cuts would at least partially pay for themselves through increased economic growth were correct." 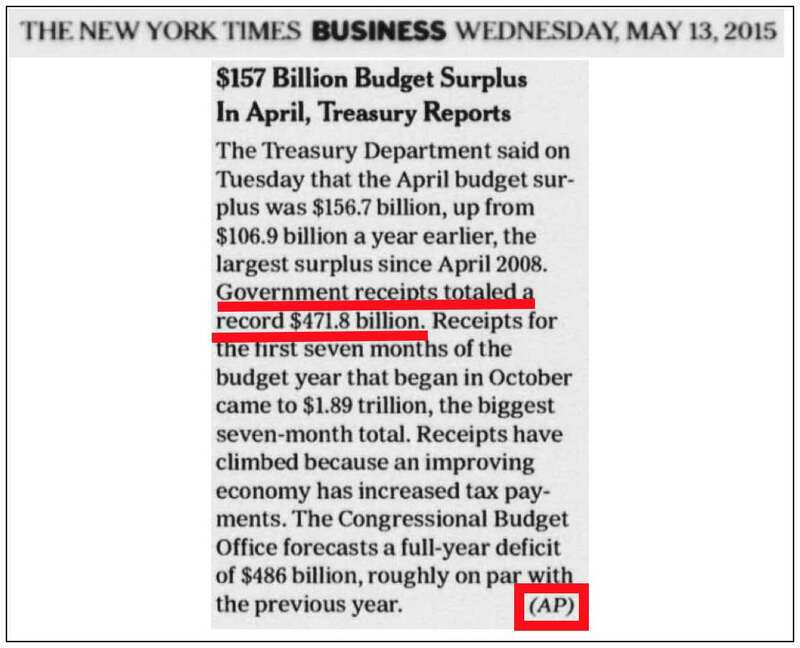 Less widely distributed Reuters and Bloomberg dispatches cited April's $510 billion in collections. Yet the AP's Boak didn't, likely because disclosing it would have discredited his inane "blame the tax cuts" claim. On Monday, thanks at least partially to the misleading cover provided by AP, Politico columnist Brian Faler claimed the "GOP tax cut (is) not why economy is booming." As long as AP's gatekeepers won't report basic truths, rubbish like Faler's will proliferate.